The margin of safety is the difference between the amount of expected profitability and the break-even point. 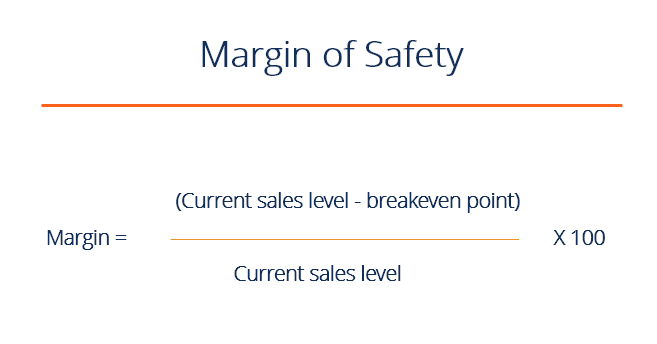 The margin of safety formula is equal to current sales minus the breakeven point divided by current sales. In budgeting and break-even analysis, the margin of safety is the gap between the estimated sales output and the level by which a company’s sales could decrease before the company will become unprofitable. This signals management of the risk of loss that may happen as the business is subjected to changes in sales, especially when a significant amount of sales are at risk of decline or unprofitability. 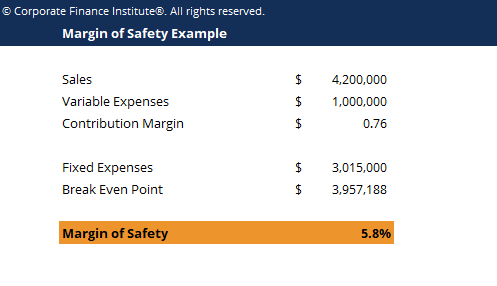 A low percentage of margin of safety might cause a business to cut expenses while a high spread of margin assures a company that it is protected from sales variability. In the principle of investing, margin of safety is the difference between the intrinsic value of a stock against its prevailing market price. Intrinsic value is the actual worth of a company’s asset, or the present value of an asset when adding up the total discounted future income generated. When applied to investing, the margin of safety is calculated by assumptions, meaning an investor would only buy securities when the market price is materially below his estimated intrinsic value. Determining the intrinsic value or true worth of a security is highly subjective because each investor has a different way of calculating intrinsic value, which may or may not be accurate. The fair market price of the security must be known in order to then use the discounted cash flow analysisDiscounted Cash Flow DCF FormulaThe discounted cash flow DCF formula is the sum of the cash flow in each period divided by one plus the discount rate raised to the power of the period #. This article breaks down the DCF formula into simple terms with examples and a video of the calculation. The formula is used to determine the value of a business method to give an objective fair value of a business. What is the margin of safety formula? In accounting, the margin of safety is calculated by subtracting the break-even point amount from the actual or budgeted sales and then dividing by sales; the result is expressed as a percentage. Ford company purchased a new piece of machinery to expand the production output of its top of the line car model. The machine’s costs will increase the operating expenses by $1,000,000 per year, and the sales output will likewise augment. After the machine was purchased the company achieved a sales revenue of $4.2M, with a breakeven point of $3.95M, giving a margin of safety of 5.8%. What is the ideal margin of safety for investing activities? Deep value investing – buying stocks in seriously undervalued businesses. The main goal is to search for significant mismatches between current stock prices and the intrinsic valueIntrinsic ValueThe intrinsic value of a business (or any investment security) is the present value of all expected future cash flows, discounted at the appropriate discount rate. Unlike relative forms of valuation that look at comparable companies, intrinsic valuation looks only at the inherent value of a business on its own. of these stocks. This kind of investing requires a large amount of margin to invest with and takes lots of guts, as it is risky. Growth at reasonable price investing – choosing companies that have positive growth trading rates which are somehow below the intrinsic value. How important is the margin of safety? A high safety margin is preferred as it indicates sound business performance with a wide buffer to absorb sales volatility. On the other hand, a low safety margin indicates a not so good position and must be improved by increasing the selling price, increasing sales volume, improving contribution margin via reduction of variable cost, or adopting a more profitable product mix. For investors, the margin of safety serves as a cushion against errors in calculation. Since fair value is difficult to accurately predict, safety margins protect investors from poor decisions and downturns in the market. This has been a guide to the margin of safety formula. CFI is the official provider of the Financial Modeling and Valuation Analyst (FMVA) certificationFMVA™ CertificationThe Financial Modeling & Valueation Analyst (FMVA)™ accreditation is a global standard for financial analysts that covers finance, accounting, financial modeling, valuation, budgeting, forecasting, presentations, and strategy. , designed to transform anyone into a world-class financial analyst.